This image, among many in this moving tribute to our Service men and women, is of the 852nd Bomber Squadron of the United States Army Air Corps. 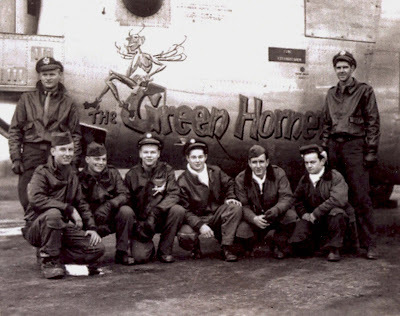 The bomber, called Green Hornet - B-24-J (serial number 44-40286), the craft was shot down about 10 miles west of the Rhine River on March 24, 1945. Among the crew of the Green Hornet, was Staff Sergeant Delbert Ben Carr of Burbank, California. Sergeant Carr was buried in Plot 1, Row 19, Grave 10 in the Netherlands American Cemetery, Margraten, Netherlands. Delbert B. Carr, Right Waist Gunner. The City of Burbank’s Veterans Commemorative Committee has just published a powerful tribute to the men and women of this San Fernando Valley city who have given their lives in the service of the United States of America. Interested parties should contact the Burbank Park Recreation and Community Services Department to purchase the book.